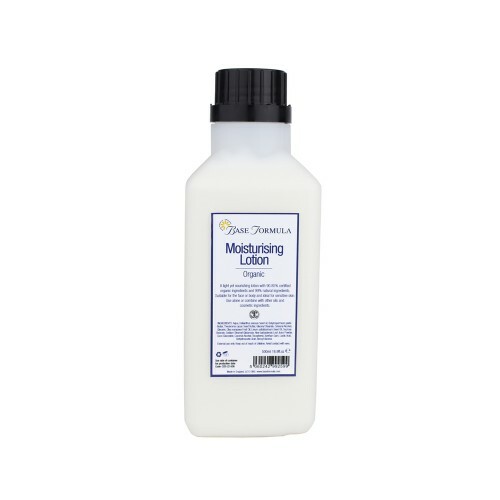 A luxurious Organic Moisturising Lotion base blended using 99% natural ingredients. 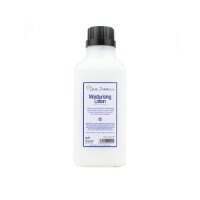 This product is formulated to accept the addition of essential oils. Base Formula's Organic Moisturising Lotion is formulated with 99% natural ingredients and 90.85% organically certified ingredients. It is suitable for use as a facial, hand and bodycare lotion and is ideal for dry and sensitive skin. It has been formulated with high quality ingredients to gently replenish moisture and oil lost by the skin and can be used therapeutically to soothe and relieve the discomfort caused by rough and dry skin. The lotion has been formulated to be used alone or blended with essential oils, carrier oils and other cosmetic ingredients to produce a range of tailor made skincare products. Professional Tip: The experts at Base Formula recommend that no more than 1% or 10ml of any essential oil and 2% (20ml) of liquid ingredients such as aloe vera or hydrolats be added to a litre of our cosmetic bases. Exceeding this amount may destabilise the blend. Over time this may cause the bases to lose some of their luxurious properties including viscosity and silky texture.